Society of America, and joined Greg Ashley to perform the entire Death Of A Ladies’ Man album for Sylvie Simmons’s Leonard Cohen biography in 2012. 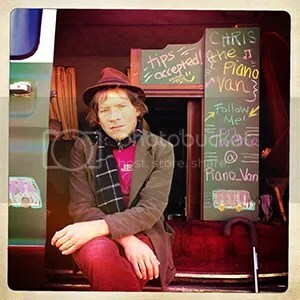 His most recent musical project (a collaboration with filmmaker Jeff Feuerzeig) is pianovan.com. We went Behind the Sestina with Stroffolino to discuss his sestina, “In Memory of My Rock Band: Sestina,” featured in The Incredible Sestina Anthology. I think I knew some Auden ones, but got turned onto the form through John Yau. I think there was at least one his book Corpse & Mirror, but I forget its name, and lost all my books, and he also turned me onto Ashbery’s use of the form, which I’ve also loved, especially the “double sestina” in Flow Chart. I have different favorite sestinas at different times, many by less famous writers. I know there was at least one Anne Waldman one that really impressed me. We’re curious about your sestina-writing life. You’ve written quite a number of them, or at least three– what keeps you coming back (or are you “sestina retired,” as one poet once said)? I love the way it allows writers to be more conversational; it’s one of the few traditional forms that can unlock, rather than block, content—at times even too much! It can also allow for really lazy writing! I had dabbled with the form, but never felt any were worthy of publication. In 2004/05, however, after suffering a life changing accident, and being bedridden and not able to walk, I began focusing most of my writing energies on a prose memoir. At the time, I was very much “in demand” as a poet, much more than a prose writer, and publishers wanted poems. That’s when I wrote most of the ones you saw. 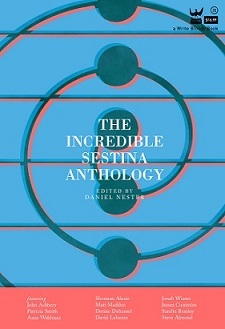 In retrospect, one could say publishing, and even writing the poems, was a transitional phase, between “poetry” and “prose.” I wouldn’t call myself “sestina retired,” because I may return to that form in the future. And I hope to write more Septinas as well; an accidental form I discovered while working on sestinas. Can you walk us through the composition or inspiration of of “In Memory Of My Rock Band”? Is it inspired by real-life events or band? Starting with a “formal problem” and taking relatively randomly chosen words that balance more “general” or “universal” words (friends, rest, and waiting) with more specific words (rehearsal, guitarist and band) seemed like a good recipe for creation of sestina, especially since the word “rest” is commonly used in at least two different ways. I had no idea when I began it what I was going to say, but I knew it that would focus on the social relationships of bands; how many bands, whether good or not, whether famous or not, become dysfunctional families. Once the form is established in a sestina, the task is to see if those “ending words” (Is there a technical word; I forget?) can actually create some kind of narrative. If it manages to “say something” that can reach the prose intelligence (for instance, McSweeney’s), I always considered that “gravy.” The piece definitely has many of the multiple-lined (Ashberian or Proustian) sentences that were one of my “poetic trademarks” (or habits) at the time—the kind of sentences I liked to read very fast at performances, to break up the tempo and give my poetry readings a musical feel, but a relatively clear narrative ends up emerging, and the persona of lyrical complaint. And out of that narrative and persona came the title, which is both a literary reference and more confessional and autobiographical than I could admit to myself during the time of writing it. Some “rock critic” talk emerges alongside the confession (Replacements, Beatles), but I was just primarily happy that I sustained the form, with some humor and “music,” regardless of what I saying! I remember performing it with a “noise band” backing me up while opening for Damon & Naomi in SF. I wish I had a recording of that. Obviously, working on a very self-pitying memoir at the time informed the sensibility, but I know other musicians in other bands who have seen enough of their reflections in, especially the “men’s room” that so many bands become, alas. On the ethical level of content, I’m most happy that this sestina at least points towards some of the things I did later (I did find that studio work with Greg Ashley, and I did get to work with better rhythm sections with a more groove based band, for instance). This entry was posted in Behind the Sestina and tagged art, Behind the Sestina, chris stroffolino, form, in memory of my rock band: sestina, Jeff Feuerzeig, Laney College, Leonard Cohen, McSweeney, poem, Poetry, rock 'n roll, Sestina, Silver Jews, Sylvie Simmons, The Incredible Sestina Anthology. Bookmark the permalink.